Mt. 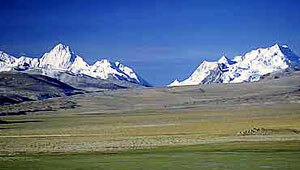 Nojin Kangsang is one of the excillent peaks in Tibet/Lhasa . This is not the technical expedition in comparison with other expeditions in Tibet. This mountain located in between Zhangmu and Lhasa of Tibet. The base camp located in the eastern ridge of Nojing Khangsantg Beyond Nojing Khangsantang base camp. Nojinkangsang was fist climbed on April 28, 1986 by a Chinese – Tibetan mountaineering team, The following is the trip itinerary which is starts from Zhangmu and ends in Lhasa. Day 05: Drive to Kathmadu - Zangmu(2350m), O/N at hotel. Day 06: Zangmu - Tingri(4250m), O/N at hotel. Day 07: Tingri - Xigatse(3900m), O/N at hotel.